The Foundation recently received a donation of $20,000 from David Poff to support Seminole County Public Schools’ robotics programs. David sees Central Florida as more than just a tourism center and wants to help transform it to one of the top technology hubs in the nation. He strives toward this goal not only as a supporter of local corporations, but also by partnering with education. His confidence in Seminole County Public Schools made his decision to invest in our school’s robotics programs a clear one. “I believe the quality of SCPS to be Seminole County’s greatest asset. It drives economic development, property values, and tax revenues,” stated Poff. 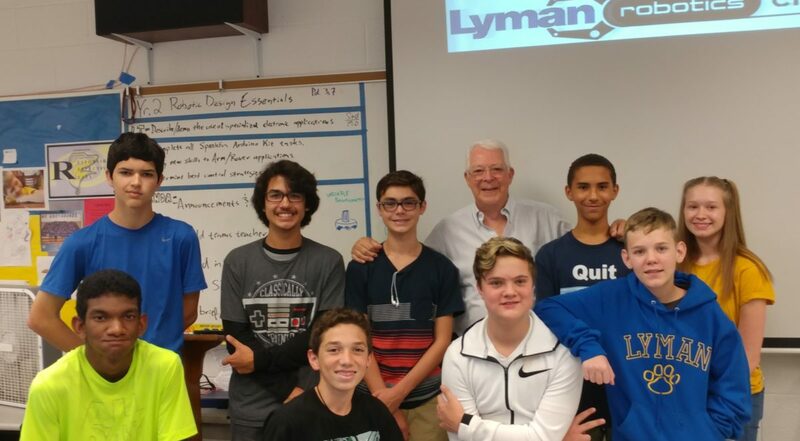 The robotics programs benefiting from his donation at Lyman High, Crooms AOIT, Lake Mary High, Seminole High, Milwee Middle and Goldsboro Elementary will help expose students to STEM in new and exciting ways. These experiences are meant to prepare students for college and beyond as they become the workforce of tomorrow. Thank you Mr. Poff for supporting the students of Seminole County Public Schools!